With Tata's debut in the performance-oriented car space with its JTP range of vehicles, let's see how the Tiago and Tigor JTP fare against their well-established rivals, the Maruti Suzuki Baleno RS and the Volkswagen Polo GT. With the arrival of the JTP range of performance oriented-cars from Tata, the compact performance car segment has now expanded and has even broken the earlier sub-ten lakh rupee barrier. With the Tiago JTP, this niche segment is now accessible from a much lower price point. 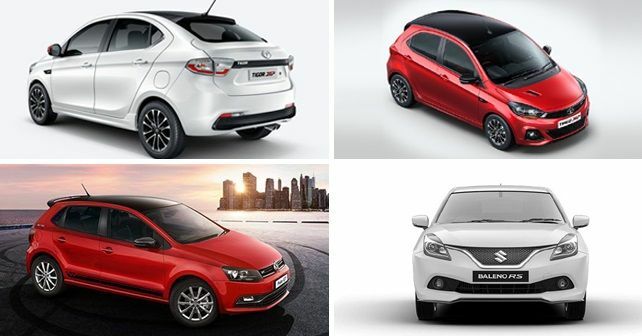 While the Baleno RS and Polo GT belong to a different segment than the JTP twins, however, on the basis of performance, they can surely be subjected to a comparison. Other than these vehicles, another car in the segment which is not strictly a performance-oriented vehicle but comes with a stiffer suspension setup and some other tuning tweaks is the Ford Figo S. However, since its a diesel car, we have kept it out of this comparison. Starting off with the dimensions, the Baleno RS offers maximum length, just ahead of the Tigor JTP by a hair's length. However, despite the similarity in length, the Baleno RS has a longer wheelbase by 70mm. In terms of ground clearance as well, the Baleno RS emerges a clear winner among all four. Where the Tigor JTP shines is in the boot space it offers. Looking at the mechanical specs, the Polo GT TSI differs from its competitors quite a bit. In comparison, it's the only car which offers a four-cylinder motor and the option of an automatic gearbox. While the Polo GT TSI and the JTP twins both feature 1.2-litre motors, the Polo offers a higher torque figure. On paper though, the JTP twins have the most power with 112bhp. Lastly, a brief look at the equipment checklist reveals the differences between the JTP twins where the Tigor emerges as a more valuable proposition. The Polo GT TSI, which is the only one here with cruise control on offer, misses out on some premium features like a rear parking camera and LED tail lamps. In terms of safety, all four cars are equally matched with all of them offering safety features such as dual airbags and ABS as standard. Most importantly, however, its the price which demarcates the JTP twins from their competition and indeed, allows them to wear the 'affordable performance car' tag. While the Polo GT and Baleno RS have been with us for quite some time, you can read our first drive review of the newly-launched Tata Tiago and Tigor JTP here.